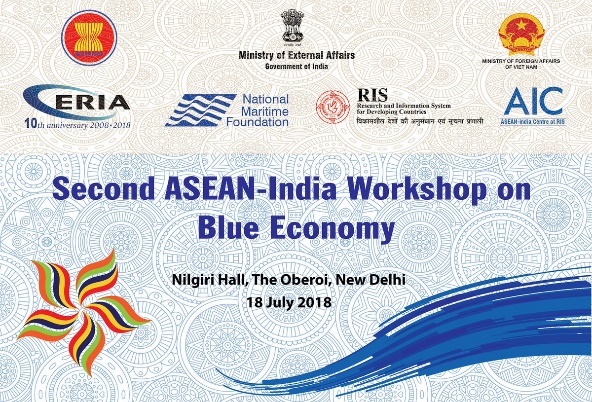 The 2nd ASEAN-India Workshop on Blue Economy was held on 18 July 2018 in New Delhi. The Workshop aimed to build on the discussion held at the 1st ASEAN-India Workshop on Blue Economy from 24-25 November 2017 in Nha Trang, Viet Nam and added substance to the efforts towards achieving the vision of the leaders to progress ASEAN-India cooperation in the maritime domain as a key facet of the ASEAN-India Strategic Partnership. The Workshop was divided into four sessions aimed at facilitating an in-depth discussion on Blue Economy with an aim to identify the specific areas where ASEAN and India can cooperate and work together. The four sessions include: Strengthening Maritime Connectivity in context of Blue Economy (Session 1); Technology in Aid of Blue Economy (Session 2); Development of Blue Economy (Session 3); and Maritime Safety and Diplomacy (Session 4).